Credit: Abigale Wyatt (PhD student, Princeton University). Download this image (JPG, 132 KB). [27-Aug-18] Several times a day during the EXPORTS cruise, a Conductivity, Temperature, and Depth (CTD) instrument is deployed and retrieved. A CTD is a water-analyzing device equipped with niskin bottles that fill up at depth. In the lab, researchers acidify samples to decrease their pH, followed by an addition of potassium permanganate to allow the water to release particulates. Finally, the thorium radiation from the filtered samples is counted using a RISO machine, in order to investigate how carbon is cycled by the ocean. 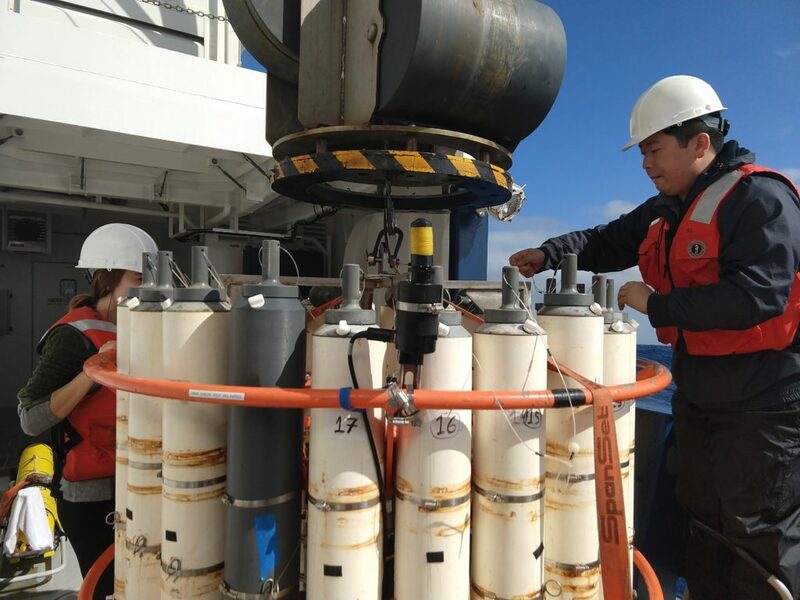 In this image, Scientist Yuanheng Xion opens the niskin bottles before a test CTD cast on a rare cloudless day in the Gulf of Alaska during the EXPORTS cruise.